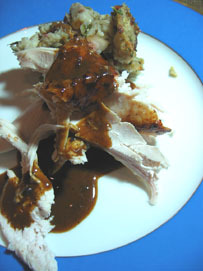 This was a SUPERB Turkey recipe that we did LAST Thanksgiving. We are not doing a turkey this year so I thought I would simply re-post this entry for those of you who are crazed and hunting for a last minute recipe. This one has the tradition of an American turkey, but with the flavors of the Orient… This was one delicious turkey and the gravy was to die for… A HAPPY THANKSGIVING TO ALL MARKETMANILA READERS WHO CELEBRATE THE HOLIDAY!!! I bet 99% of you wouldnâ€™t have guessed that the Chinese Five Spice Powder that I made in the previous post was a critical requirement for this fabulous looking and tasting turkeyâ€¦ Y up, I have cooked this turkey recipe at least three times since I first saw it in the 2002 Thanksgiving Issue of Gourmet Magazine and their recipe is now, thankfully, on-line. It is extremely simple to do and results in a burnished, Copacabana-tanned skin that is incredibly appetizing, with the most flavorful of gravies. The fact that the recipe includes Damson Plum jam makes it a real keeper. It is a Marketman favorite. This 12 pound bird (donâ€™t you just hate it when they arenâ€™t 20-25 pounds at least â€“ I mean who really wants to cook a petite Turkey??!) took just 2 hours and 40 minutes to cook (stuffing cooked separately). As it was roasting, we made a couple of different types of stuffing. Throw in some baked sweet potatoes and perhaps one green vegetable dish and you have an â€œexpressâ€ Thanksgiving meal. If you are looking for a nice holiday meal this December, this is a definite option. Not much fuss, very little last minute preparation and impressive looking resultsâ€¦ Totally doable in Manila. I have a question about brining – does it affect the taste of the meat? (Does it make it saltier, if that makes any sense? hehe). The brining makes the meat more juicy. I think it is a touch saltier, but I don’t think most folks would be able to tell if you didn’t say the bird was brined. Just rinse the turkey under cold running water when you have removed it from the brine. Pat dry with a clean kitchen towel and then continue with the rest of the recipe. Hi Marketman!I’ve tried brining shrimp and it turned out awesome! I’d like to try brining turkey but do you think i could practice with a whole chicken first? How much salt for say a 1.5 k chicken and how long should it brine? Also where can i buy plum sauce in manila? Got a tote and a t-shirt at S&R Fort last Sat. I think it’s wonderful what you and your family are doing. You can count on me to support future projects. God Bless your fammly and your crew. Cindy, you might try a 1.5 kilo chicken i a stainless steel pot, filled with water to cover the chicken. Add maybe half a cup of sea or rock salt and brine for say 6-8 hours, leaving it all in the fridge. You will need plum jam for this recipe. Try the larger groceries. Glad you were able to pass by S&R for a t-shirt and tote…the kids will appreciate your help! I am still leary about this brining, afraid that it will be too salty, but I believe ya’ll. However, I am running out of time, and its Wed. noon here, haven’t bought the turkey, (hope to get a chilled/never frozen one); lunch has to be served at 12:00 noon Thursday. Tried soaking the bird in Dr. Pepper years ago, and it came out great. Dunno if I will do it again or brine. For sure for Christmas eve, I will try brining whole chicken. Brining a turkey makes the meat juicy. The membranes somehow takes more liquid rather than the salt. I brine a whole turkey overnight in 2 gallons of water with 1 lb of kosher salt, 1 lb of dark brown sugar, fresh rosemary and fresh thyme. Rinse, pat dry and use some cajun or creole seasoning. I usually deep fry the whole turkey in about 4 to 4 1/2 gallons of peanut oil. It takes longer to heat up the oil (about 55 minutes at 400F ). Three minutes per pound plus five minutes. Let it stand for about 30 minutes. Deep frying a turkey is dangerous and we do take a lot of precautions. There is always someone watching the fryer. We have an ABC extinguisher just in case. We use heavy duty gloves, goggles and no lose clothing. The whole process of cooking turkey this way is a science experiment every year. My daughter made a comment that it is a lot of work so we do it a least twice a year. The family loves it that way. Have a nice Thanksgiving. Am thinking of cooking crown roast of pork. Do you think it will be ok if i brined it? There was a brining solution in yummy which also includes sugar as well as salt in the recipe. Which do you think would be better? Gud morning, Mr. Marketman! Pleasantly surprised to find your website.What a blessing!Am even morre delighted to know through the readers’ comments about a the growing awareness and demand for a healthy meat option. You see, my husband raise turkeys in our Antipolo farm. I process them into burger patties, nuggets, kiddie burgers, meat balls. This year, I am going into ham making to serve the Filipino market. We our locally grown, raised turkeys, we don’t have to settle for the frozen imported Butterball, Norbest or Shelton brand. We have them right in our farm where they grow organically. I forgot to mention that, our turkey adobo flakes was a hit as a corporate giveaway last Christmas! We need to improve lang our packaging. Thanks talaga to Marketman! Very interesting mga tips and recipes. For your turkey needs, please email your orders. We sell ground meat, wings for broth, liver and gizzard for pate. This looks really delicious, and I’m really sad I only found this now and not earlier, during the holiday seasons. I only have to ask what suggestions you have should you be unable to find the plums you need (where I live, plums are rather rare). that goes for any other ingredient in the recipe, actually. Marketmanila.com Feeding Program — Four Consecutive Years, @150,000 Meals! What is Your Favorite “Street Food”?? ?